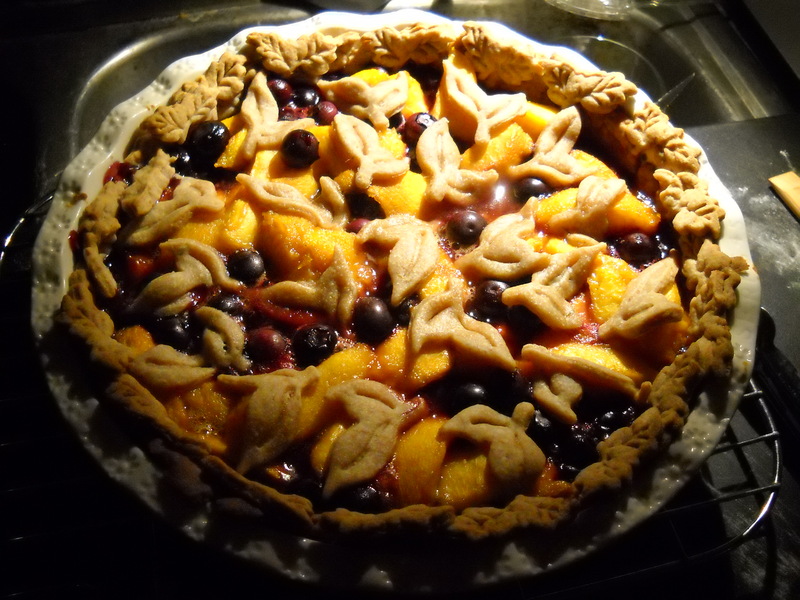 Peach-Blueberry Pie w/ Lavender & Coconut Scented Crust. The first thing I want to say is forgive the ugly photos. 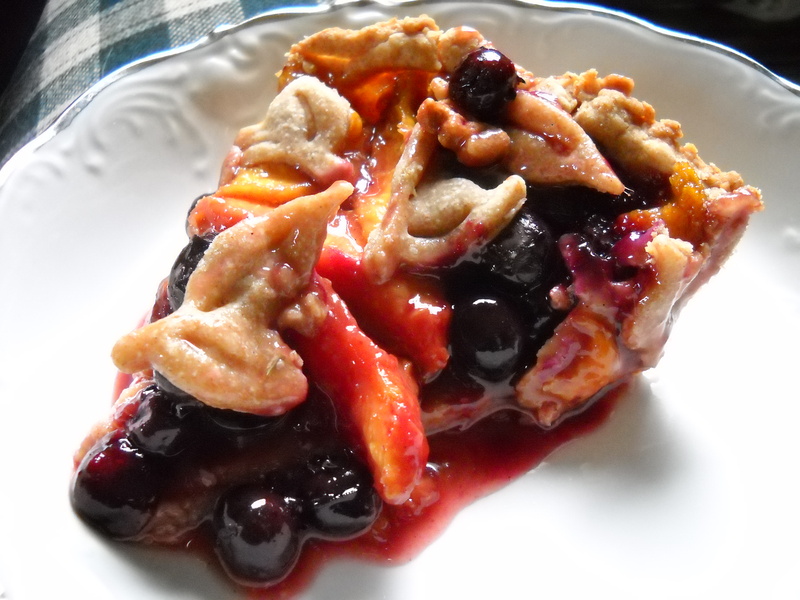 This is a pie I threw together a couple of years ago. It turned out pretty amazing, but I’ve never gotten around to taking some better pictures of it. The coconut scentedness was not entirely on purpose. I wanted to make a wheat crust with coconut oil, but I had run out of the refined (the kind with no coconut smell or taste). I only had virgin coconut oil on hand, so whatever, I used it. I thought it added a delightful dimension to this pie. Nowadays I typically like to use a combination of virgin coconut oil and Earth Balance Coconut Spread. The crust recipe doubles just fine if you want two pie crusts. Making the crust as is, will yield one bottom crust plus enough scraps to make some leaves or decorations. To make the crust, combine the flours, sugar and salt. Add the coconut oil and spread in tablespoons or chunks. Use a pastry cutter to cut in the coconut oil and spread until you start seeing fine crumbs. Add the ice water and vodka. Stir until a dough starts to come together. If you need more liquid, add more ice water 1 tbsp at a time. Take your ball of dough and flatten it into a disk. Cover in plastic wrap and place it in the fridge for at least an hour or until you’re ready to use it. Take the crust from the fridge and roll it out to fit your pie plate. Use the remaining dough to cut out shapes for the top. Poke the crust with a fork for ventilation. I didn’t have pie weights back when I first started making this pie, so I don’t think you’ll need them. Use them if you have them, or if you want to use dried rice or beans as weights, go right ahead! Remember to line your crust with parchment if you’re using weights of any kind. Bake crust at 450°F for about 10 minutes. Remove from the oven and let cool for a few minutes. For the filling, place the fruit in a big mixing bowl. Add sugar, arrowroot, cinnamon and lavender. Pour the filling into the crust and bake pie for about 10 min at 450°F. Lower oven temp to 350°F and bake pie about 35 min or until filling is hot and bubbling. ← Cherry-Bulgur Burgers w/ Rosemary & Daiya Jack Cheese. Thank you! I hate it when I think the pictures don’t justify the delicious!